To Cite: Pezeshki Najafabadi M, Mohammadi-Sichani M, Javad Kazemi M, Shirsalimian M, Tavakoli M. Investigation of the Chemical Composition and Different Effects of a Rumex dentatus Methanol Extract Against Drug Resistant Pseudomonas aeruginosa Isolates, Iran Red Crescent Med J. 2016 ; 18(12):e27064. doi: 10.5812/ircmj.27064. Background: The emergence of Pseudomonas aeruginosa as a multiple drug resistant bacteria has renewed efforts to identify alternative antibacterial materials, such as medicinal plants. Objectives: The aims of this study were to investigate the antibacterial effects of a Rumex dentatus methanol extract against drug resistant P. aeruginosa isolates and to analyze the chemical composition of this extract. Materials and Methods: Sixty strains of P. aeruginosa were isolated from urine and wound samples and identified using conventional tests, as well as 16S rDNA gene sequencing. Results: The isolates were completely resistant to the tested antibiotics, with minimum inhibitory concentration (MIC) values for ceftazidime, imipenem, and gentamicin between 256 to > 256 μg/mL, 8 to > 256 μg/mL, and 64 to > 256 μg/mL, respectively. The R. dentatus extract had a broad spectrum activity against all tested isolates and maximum growth inhibition against isolates from burn wound and urinary tract infections occurred at 200 mg/mL (22.43mm and 22.86mm, respectively). The means of the MIC and minimum bactericidal concentration (MBC) values were 25 and 50 mg/mL, respectively. The effects of a combination of the methanol extract and ceftazidime, imipenem, and gentamicin antibiotics were antagonistic. The GC-MS analysis of the methanol extract revealed a high probable presence percentage of alpha-pinene, sabinene, and eucalyptol (1, 8-cineole) that have confirmed antimicrobial activity. Conclusions: The R. dentatus methanol extract with broad spectrum activity can be viewed as an alternative to antibiotics for treatment of P. aeruginosa infection. Pseudomonas aeruginosa is an important cause of infection and one of the most common pathogens isolated from patients who have been hospitalized for durations longer than one week (1). The increasing antibiotic resistance in P. aeruginosa, like that seen in other hospital bacteria, makes treatment of this bacterium quite challenging (2). A previous study addressed examined Iranian isolates of P. aeruginosa that were resistant to penicillin (100%), tetracycline (90.19%), streptomycin (64.70%), and erythromycin (43.13%) (3). Another study showed a 22.2% resistance of P. aeruginosa to imipenem and meropenem (4). The appearance of pan-drug resistant strains of this pathogen render it truly untreatable with current antibiotics and has spurred efforts to develop antibacterial agents active against them (4, 5). An alternative and safe approach to treatment is to use medicinal plants (6). Medicinal herbs have been used for the treatment of human diseases and contain biologically active chemical compounds that act as antimicrobial agents (7, 8). These plants are replete with drugs and have had wide use in traditional medicine (8, 9). Plants are attractive choices because of their low toxicity and side effects and because they are cheap and available (10). One of the medicinally important plants is Rumex dentatus L., which is grown locally as a vegetable in some countries. It belongs to the Polygonaceae family, and it contains a large number of biologically active and chemically complex compounds. R. dentatus is traditionally used medicinally for its anti-dermatitis, bactericidal, anti-inflammatory, and anti-tumor effects (11, 12). The antimicrobial activity of an R. dentatus extract demonstrated significant inhibitory effects against different microorganisms, including Gram positive (for example, Staphylococcus aureus and Streptococcus mutans) and Gram negative (for example, Escherichia coli and Pseudomonas aeruginosa) species, as well as fungi like Candida albicans (5, 9, 11, 12). The aims of this study were to analyze the chemical composition of an R. dentatus methanol extract and to determine the antibacterial effectiveness of this extract, alone and in combination with different antibiotics, against pan drug resistant P. aeruginosa isolates. This research study was designed to investigate the antibacterial effects of an R. dentatus methanol extract against P .aeruginosa isolates, and to compare its effectiveness to that of gentamicin, imipenem, and ceftazidime when supplied alone or in combination with these antibiotics. In addition, the chemical compositions of this extract were analyzed. Samples were collected from bacterial cultures made from urine and wound infections at the Mahdiyed diagnosis laboratory center and Emam-Mosa-Kazem hospital in Isfahan, Iran, during 6 months and were cultured on blood agar (BA) and eosin methylene blue (EMB) media (Himedia Company, India) and incubated at 35°C for 18 - 24 hours. The pure isolates were identified according to gram straining and biochemical tests (13) and then were confirmed by a PCR reaction using 16S rDNA with the specific primers: PA-SS-F (5’- GGGGGATCTTCGGACCTCA -3’) and PA-SS-R (5’- TCCTTAGAGTGCCCACCCG -3’) that gave a 956 bp product. The PCR reaction was carried out in a final volume of 25 μL, containing 2.5 μL 10x PCR buffer, 2 μL DNTP mix (concentration 10 mM) (Fermentase, Germany), 5 μL MgCl2 (concentration 25 mM), 0.5 μL forward and reverse primers (concentration 10 mM), 0.2 μL Taq DNA polymerase (Genetbio, Korea), 2 μL DNA (150 - 200 ng), and 12.3 μL nuclease-free water. The PCR amplification included the following steps: initial denaturation (1 cycle for 3 minutes at 95°C), annealing (35 cycles for 20 seconds at 94°C, 30 seconds at 58°C, and 40 seconds at 72°C), and final extension (5 minutes at 72°C). 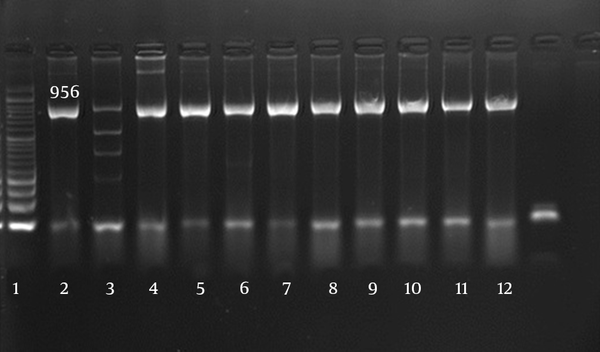 The resulting PCR products were analyzed in a 1% agarose gel with ethidium bromide staining and UV light. The PCR-based identification results were confirmed by 16SrDNA sequence analysis performed by the Serikembangan Company. DNA was amplified with a RIbo-Prep PCR kit (Amplisense Biotechnology, Russia) (Figure 1). Lane 1, 100-bp DNA ladder; lane 2, Pseudomonas aeruginosa ATCC 27853 as the positive control; lane 3, E. coli ATCC25922 as negative control; lanes 4 - 7, P. aeruginosa strains were isolated from wounds; lanes 8 - 12, P. aeruginosa strains were isolated from urine. The resulting sequences were visualized using Chromas version 2.1.1 and identified using BLASTn in the NCBI database (www.ncbi.nlm.nih.gov/Blast). Isolates were accepted if their 16SrDNA sequences had high similarity to the 16SrDNA sequences of a P. aeruginosa standard strain (14). Kirby Bauer's disc diffusion method on Mueller-Hinton agar was used to determine the antibiotic sensitivity patterns for amikacin, cefotaxime, ceftizoxime, gentamicin, ciprofloxacin, imipenem, and tobramycin, according to the clinical laboratory standard institute (CLSI) recommendations (All antimicrobial disks were obtained from BD BBL Sensi-Disc, Becton Dickinson, Sparks, MD). In addition, the minimum inhibitory concentrations (MICs) for ceftazidime (C3809, Sigma-Aldrich, USA), imipenem (I0160, Sigma-Aldrich, USA), and gentamicin (G6896 Sigma-Aldrich, USA) antibiotics were determined using the micro dilution method, as previously described (13). The stock solutions of antibiotics were prepared according to CLSI guidelines. The final concentrations of antibiotics were between 2 and 2048 µg/mL. P. aeruginosa ATCC: 27853 and E. coli ATCC: 25922 were used for the quality control. The plates were incubated at 37°C for 18 hours. The diameter of the zone of inhibition was measured to determine the degree of susceptibility of the isolates to each antibiotic and was interpreted as sensitive (S), intermediate resistant (I), or resistant (R). The leaves and stems of R. dentatus were collected from, Oshtran-Koh, Gahar and around Gahar lake in Lorestan province, Iran. R. dentatus was identified by the herbarium of the research institute of agriculture Jihad of Lorestan, Iran. The plant material was extracted using a Soxhlet apparatus. Briefly, 60g of dried plant parts were powdered and a methanol extract was prepared with 500cc methanol as a solvent in a Soxhlet extractor. The resulting extract was then dried, weighed, and stored in sterilized capped vials at 4°C until further analysis (5). The agar well diffusion method was used for evaluation of the antimicrobial activity of the R. dentatus methanol extract against P. aeruginosa strains. Microorganisms were cultured at 37°C for 4 hours to achieve a turbidity equivalent to 0.5 McFarland standard (Pasteur Inst., Tehran, Iran). Wells (6 mm) were made in the petri dishes prepared with Mueller Hinton agar (MHA)(Merck, Germany) and 100 μL of different concentrations of the extract (200, 100, 50, 25, 12.5 mg/mL) prepared in 10% dimethyl sulfoxide (DMSO) (Merck, Germany) were added to the wells. The same volumes of DMSO were used as the negative control. The inoculated plates were incubated at 37°C for 24 hours and the inhibition zones around the wells were measured in millimeters. Each test was performed three times and the results were expressed as mean values (5). The MICs were determined by the broth dilution method (5, 11, 12). Briefly, 100 μL of a fresh P. aeruginosa strain was loaded into the wells of a polystyrene 96-well microplate, and 100 μL methanol extract and 100 μL Muller Hinton broth (MHB) (Merck, Germany) were added. The final concentrations of the methanol extract were 200, 100, 50, 25, 12.5mg/mL. All inoculations were performed in triplicate. The positive control well was filled with 100 μL bacteria and 200 μL fresh MHB and the negative control well was filled with 300 μL fresh MHB. Plates were incubated for 24 hours at 37°C. The MIC values were recorded as the lowest concentration that showed signs of turbidity; the absorbance was read at 405 nm with an ELISA reader. The minimum bactericidal concentrations (MBCs) were determined by plating bacterial suspensions at four test concentrations greater than the MIC on MHA plates and incubated at 37°C for 24 hours. The MBC was considered the lowest concentration that resulted in plates without any growth of the organism (15). The effectiveness of R. dentatus methanol extracts in combination with ceftazidime, imipenem, and gentamicin antibiotics was investigated by the checkerboard method, as previously described (16). A 100 μL volume of fresh P. aeruginosa strains with 0.5 McFarland standard turbidity was loaded into polystyrene 96-well microplates in triplicate, and 100 μL of methanol extract and 100 μL of stocks of the three antibiotics were added. The microplates were incubated for 24 hours at 37°C. Interaction was assessed algebraically by determining the fractional inhibitory concentration index (FIC index) according to previously published equations. An FIC index ≤ 0.5 was interpreted as synergism, a value of 4 ≤ FIC index > 0.5 indicated no interactions, and an FIC index > 4 indicated an antagonistic effect (16). An Agilent model 7890 GC interfaced to a 5975C mass selective detector was used for mass spectral identification of the elements of the extract. HP-5MS capillary columns (30 m × 0.25 mm × 0.25 μm film thickness) were used for GC. The oven temperature was maintained at 50°C for 3 minutes, and then programmed to 200°C at 8° C min-1, then to 290°C at 40° C min-1, where it remained for 3 minutes. The carrier gas was helium at a flow rate of 1.2 mL min-1, and the injection volume was 0.1 μL. The mass spectrometry analysis entailed electron-impact ionization at an electron energy of 70 eV with a split mode injection (30:1). The MS interface temperature was 280°C, the MS mode was EI, the detector voltage was 1.66 Kv, the mass range was 30 to 450 u, the scan speed was 2.86 scans/s, and the interval was 0.01 minute (20 Hz). The constituents of the volatile extract were also identified by comparing their GC retention indices. A mixture of aliphatic hydrocarbons (C8 - C24) in hexane (Sigma-Aldrich, St. Louis, USA) was injected using the same temperature program to calculate the retention indices. Compound identification was based on the comparison of retention indices using a MS library. The NIST spectrometer data bank was used to determine the percentage composition of the compounds. All assays were performed in triplicate and results are presented as the means. Data were analyzed statistically using ANOVA (Duncan) and SPSS version 22.0 software 2013 (SPSS Inc., Chicago, IL), Excel, and Student’s t-test, with a significance level set at P < 0.001. We also used Whonet 2013 (5.6 Switzerland, Geneva) for antibiotic susceptibility analysis. Sixty strains of P. aeruginosa were obtained and identified from clinical samples from the Mahdiyed diagnosis laboratory center and Emam-Mosa-Kazem hospital, including 30 isolates from urine and 30 isolates from burn wounds, respectively. These 60 isolates were completely resistant to the tested antibiotics, which were amikacin, cefotaxime, ceftizoxime, gentamicin, ciprofloxacin, imipenem, and tobramycin. In addition, as shown in Figure 2, the MICs for ceftazidime, imipenem, and gentamicin were between 256 to > 256 μg/mL, 8 to > 256 μg/mL, and 64 to > 256 μg/mL, respectively, which confirmed the resistance of the isolates to these antibiotics. Figure 2. Minimum Inhibitory Concentrations (MICs) Were Determined for A, ceftazidime; B, gentamicin and C, imipenem (µg/mL). The antimicrobial activity of the R. dentatus methanol extract at different concentrations (ranging from 12.5 mg/mL to 200 mg/mL) against P. aeruginosa strains was measured in “mm,” as presented in Table 1. The R. dentatus extract had broad spectrum activity against all tested isolates, and as shown in Table 1, at high concentrations, it showed promising antimicrobial activity against all strains isolated from urine or burn wounds. The maximum growth inhibitory action against P. aeruginosa isolated from burn wounds and urinary tract infections was 22.43 mm and 22.86 mm, respectively, at an extract concentration of 200 mg/mL. Statistical analysis of the data using the Duncan test indicated that difference between these concentrations was significant (P < 0.001). The mean MIC and MBC values for the R. dentatus methanol extract against P. aeruginosa strains are presented in Table 2. The mean values were similar for strains from burn wounds and urine, at 25 and 50 mg/mL, respectively. The combined effects of R. dentatus methanol extract and ceftazidime, imipenem, and gentamicin antibiotics are presented in Table 3. The FIC index values of < 0.05 were considered to indicate synergism; however, the best synergism was only 10% for the combination of these antibiotics and R. dentatus methanol extract. The prevalent effect of the combination was antagonistic. 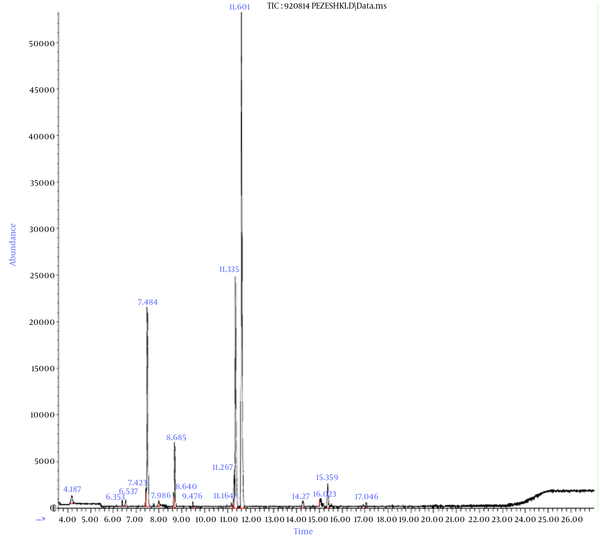 The extract products determined from the GC/MS spectrum were analyzed according to the observed peaks, as shown in Figure 3. The components of the methanol extract are identified in Table 4 and a chart showing a representative analysis of the components of the methanol extract is shown in Figure 3. The percentage of each product in the extract is shown in Table 4, which indicates a prevalence of 97% for Bicyclo[3.1.1]heptan-3-one, 2,6,6-trimethyl-(1α, 2β, 5α) in our extract. Table 4 also reveals a high probability of alpha-pinene, sabinene, and eucalyptol (1, 8-cineole), confirming the antimicrobial activity of the extract. The different molecular and natural compound families from medicinal plants show various medicinal properties. The antimicrobial activity of plant extracts against the various clinical strains of bacteria and fungi makes them potential medical treatments. The antimicrobial activity of the Rumex spp. has been confirmed against different microorganisms; for example, Nisa et al. investigated the antimicrobial and antioxidant activities of different concentrations of five R. dentatus extracts against clinical bacterial and fungal strains and showed that these extracts had a strong antibacterial effect against Klebsiella pneumoniae and Aspergillus flavus (5),. Muhammad et al. confirmed the effective antimicrobial activity of R. dentatus against Bacillus subtilis, E. coli, S. aureus, Micrococcus luteus, and P. aeruginosa (17). In the present study, we investigated the different effectiveness of an R. dentatus methanol extract against drug resistant Pseudomonas aeruginosa isolates. The R. dentatus methanol extract, especially at high concentrations, showed a broad spectrum activity against all tested isolates from urine and burn wounds; these isolates had been resistant to all tested antibiotics (pan drug-resistant), in agreement with the previous studies. Low concentrations of the extract showed lower antibacterial activity, perhaps because of a lesser amount of the antimicrobial compounds. A combination of the plant extract with currently used antibiotics was investigated in previous studies (7-9), and combined drug usage is recommended to prevent resistance from emerging during treatment and to achieve a higher efficacy in the treatment of infections. For example, Souto de Oliveira et al. investigated the synergistic activity of norfloxacin, tetracycline, and erythromycin with an ethanol extract from Mangifera indica L. peel against S. aureus strains. The extract alone did not show significant antibacterial activity but a four-fold reduction in the MIC values was obtained for tetracycline and erythromycin when the extract was used in combination with these antibiotics (18). The investigation by Toroglu of the in-vitro synergistic effects of different herbs (Rosmarinus officinalis, Coriandrum sativum, Micromeria fruticosa L., Cumium cyminum, and Mentha piperita), when combined with gentamicin, cephalothin, ceftriaxone, and nystatin, showed that the combination of plant extracts with antibiotics resulted in lower drug resistance in 13 microbial species (19). The study by Adikwu et al. on the in vitro combined effects of erythromycin and a methanol extract of leaves of Euphorbia hirta against clinical isolates of S. aureus, using the checkerboard technique, showed a synergistic effect for the combination of erythromycin and E. hirta against S. aureus at specific ratios (9:1, 8:2, 7:3, 6:4, 3:7, 2:8,1:9), while other ratios (5:5, 4:6) had no effect (9). By contrast, the results of our study on the combined effects of the R. dentatus methanol extract and ceftazidime, imipenem, and gentamicin antibiotics, also using the Checkerboard technique, indicated that the prevalent effect was antagonism. The analysis of extract components obtained from the GC/MS spectra indicated the presence of several products with known antimicrobial effects. One of these products was α-pinene, an alkene compound that belongs to terpene class and has a reactive four-membered ring. This compound is found in the oils of many species of coniferous trees, notably the pine. The essential oils of some plants can act as anti-inflammatory agents and broad-spectrum antibiotics. Sabinene, another compound present in our extract, is a natural bicyclic monoterpene isolated from the essential oils of a variety of plants and its antimicrobial activity has been proven previously (20). Eucalyptol (1, 8-cineole), also present in our extract, is a natural organic cyclic ether and a monoterpenoid. It is an active ingredient of eucalyptus oil and is responsible for its various pharmacological actions; eucalyptus oil has traditionally been used in some countries as an antiseptic treatment for respiratory tract infections (21). The antimicrobial activity of eucalyptol was reported previously by Hendry et al. against the formation of suspensions and biofilms of S. aureus, MRSA, P. aeruginosa, E. coli, and C. albicans (21). The P. aeruginosa strains investigated in this experiment were completely resistant to current antibiotics. Considering the safety of the R. dentatus extract, the prepared extract with its broad spectrum activity can be viewed as an alternative to antibiotics. However, at the present time, the combination of the methanol extract and the tested antibiotics cannot be recommended. The authors acknowledge the support of the department of microbiology in the Mahdiyeh diagnosis laboratory center.